In today's Small Batch, Phoebe Lapine of Feed Me Phoebe shows us how to make rich, nutty tahini at home. Phoebe is the co-author of In the Small Kitchen. I have a known obsession with French fries. But sometimes I think half the reason I eat so many of them on a weekly basis is because they are the best vehicles for condiments. I have very little self-control when it comes to buying, making, and hoarding condiments. Earlier this summer, I subletted my apartment to a friend. I told her I’d clean out the fridge of all perishables but leave everything else for her to enjoy. She must have been surprised to open the door and find the inside wall and one whole shelf stuffed to the gills with half-eaten red curry paste, nut butters, miso, and about 7 different kinds of mustard. In some ways this isn’t the worst food quirk. If you too are the type of person who can’t leave the farmers' market without buying an expensive (but interesting!) jar of jam, at least you know said purchases will have a long shelf-life. But in addition to turning your fridge into a condiment hospice, store-bought sauces in jars are possibly the most over-priced food products in existence. Which brings me to the subject of tahini. When a gourmet store dedicated entirely to mayonnaise opens in Brooklyn, even I am apt to roll my eyes. It’s one of the easiest condiments to make, and tastes much better prepared from scratch. But tahini is one of those condiments that most people, even many die-hard DIY-ers, don’t bat an eyelash about buying at the store. 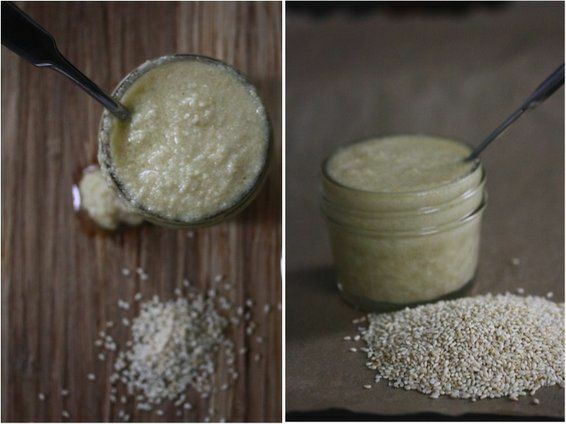 And it’s equally simple to prepare from scratch: sesame seeds and oil, pureed to smithereens. When I first set off on my DIY tahini quest, the biggest question that came up was unhulled versus hulled sesame seeds. Many recipes didn’t specify, but when I experimented, the results were pretty different. 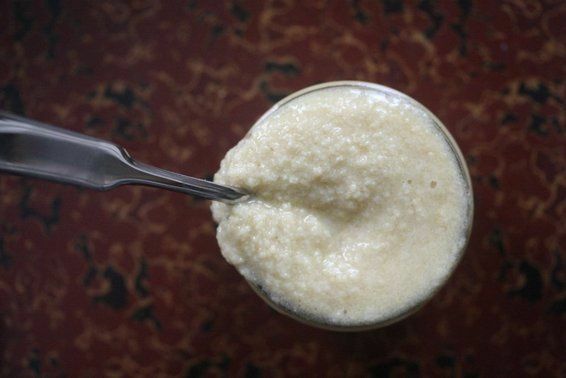 Most commercial tahinis use hulled seeds, in addition to special machinery, lots and lots of oil, and superior processing, and thus, their tahini is silky smooth. By comparison, a homemade unhulled version is decidedly the ugly stepsister of the tahini family. But it may be more beautiful on the inside. The resulting mixture is dark and very coarse – if not crunchy – and much more prone to oil separation. But it tastes deeply nutty and wouldn’t be a bad substitute for one of the many nut butters I have knocking around in my fridge. The hulled seeds at home will still give you a condiment that’s a lot less creamy than the store bought version. So if you’re addicted to the kind of tahini that sticks to the roof of your mouth, perhaps your brand of choice is worth the $6 you spend on it. But for me, queen of condiments, I’m happy to have one less wayward jar in my fridge, waiting for the next time I need a tablespoon for my salad dressing. When the craving for falafel hits, I pick up a couple dimes’ worth of bulk bin sesame seeds, and in under 10 minutes, my condiment du jour is ready for consumption. For a coarser texture and more flavorful tahini, use unhulled seeds. 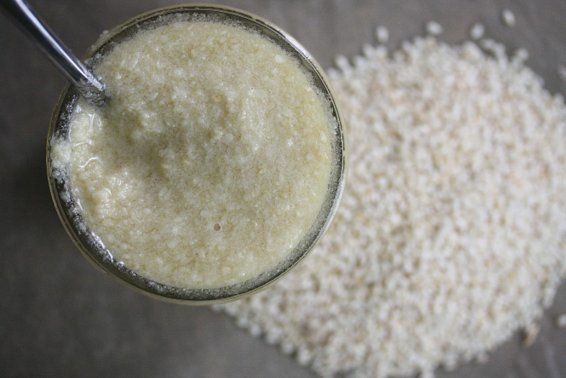 For something smoother and creamier, go with the hulled sesame. I used a mixture of olive oil and vegetable oil. I found the flavor of the olive oil over-powering in a large quantity, but liked having a little bit to give it complexity. I also used a lot more total oil than most recipes out there called for (1:1 seeds to oil versus 4:1). If you find your paste comes together with less, by all means hold your horses. 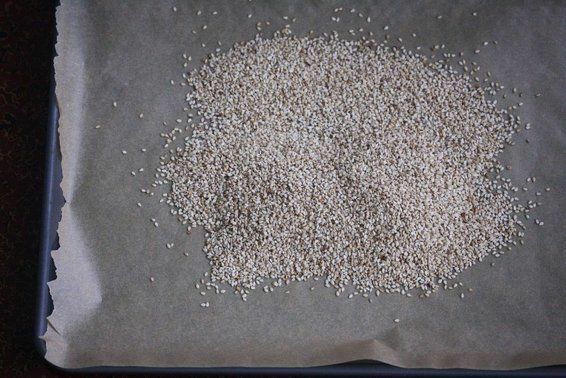 Arrange the sesame seeds on a parchment-lined baking sheet in an even layer. Toast them until golden brown and fragrant, shaking the pan halfway through cooking to redistribute, about 6 minutes. Allow the seeds to cool slightly. 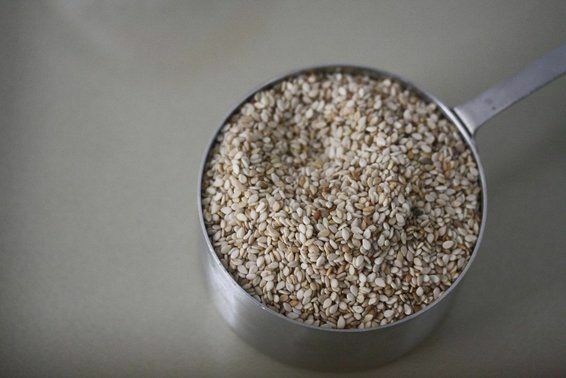 Transfer the sesame seeds to a small food processor or blender. Add the olive oil and puree, scraping down the sides of the bowl, until a paste forms. Add the salt and 1/4 cup vegetable oil. Continue to puree until smooth. Add the water – this will give the mixture a lighter, smoother texture. 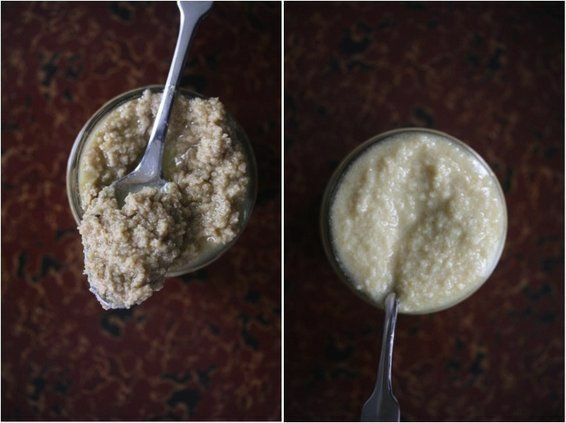 Puree until the tahini is thinner than a nut butter, smooth and spreadable. Add more oil in 1/4 cup increments until you achieve this texture (it took me a whole cup!). 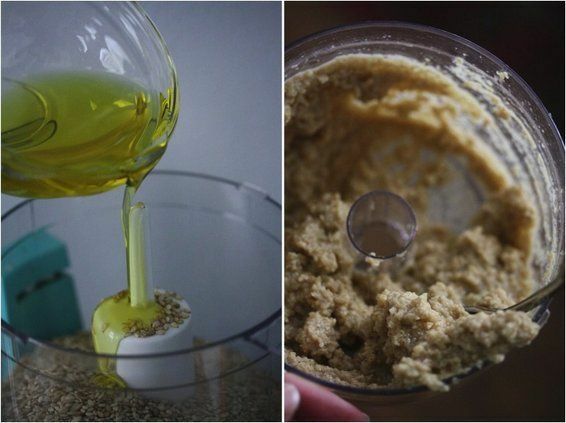 Transfer the tahini to a sterilized jar and keep in the fridge for up to a month with all of your other condiments, or use immediately in your hummus recipe or as a nutty vinaigrette. Phoebe will be answering questions about tahini on the Hotline for those of you who want to take on this project at home. For the quickest response, go to her recipe and ask a question from there -- we'll email her your question right away! Check back next week, when The Wednesday Chef's Luisa Weiss shows us her favorite way to pickle eggplant! 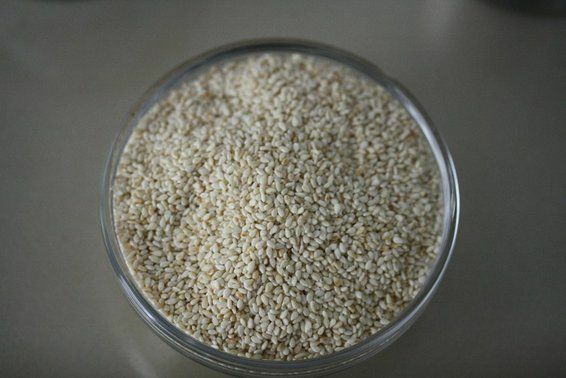 Sesame seeds, no oil, no water, nothing else. This is what tahini is. Vitamix! I love my Vitamix. This is an excellent recipe. Thank you. I make it regularly now using a Vitamix. Then I just add garbanzo beans and roasted red pepper and other hummus ingredients and voila! It's the best hummus ever. Thanks for posting this! a stick blender helps smooth it out once you do everything in the blender. I suspect they're either running it through a tamis or between rollers (like chocolate)? I just want to say thank you for this, and for the weekly Food52 Digest. At least a couple of times a month I have *headpalm* moments (as in, why didn't I think of that?!? ), that serve as inspirations to solve a problem or for some future dish. I may not make this exactly as written, but you've inspired me, yet again. Thank you! With a severe allergy to tree nuts, I am basically unable to buy commercial Tahini (due to shared equipment). That said, I adore it, and can't wait to try your recipe with unhulled seeds. I don't normally keep vegetable oil in the house. Could I use something like grape seed oil, which is supposed to light in flavor compared to EVOO? What about sesame oil, KristiW? Exact same flavor. Sorry, I meant exact same flavor as the sesame seeds. Grapeseed would definitely work! Any neutral oil of choice! A pestle and mortar may get you finer results than a blender. Good suggestion, Daddycooks! 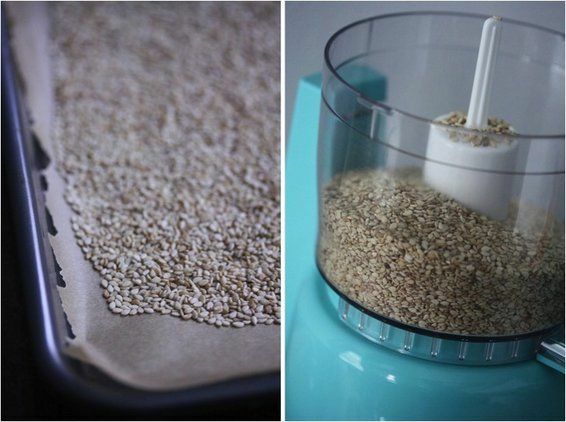 I make tahini at home and I usually use a coffee grinder (I don't drink coffee and have a coffee grinder, I don't know why) to grind up my sesame seeds -- i figure small seeds and small blades make sense. And I finish them off with a mortar and pestle.